Beosound 9000 marked a welcome return to form on the part of B&O’s designers. Many of the models introduced in the period running up to its launch, made as they were from indifferent grades of plastic and offering little to advance the cause of either styling or performance, failed to capture the essence of what had made B&O’s more traditional ranges so desirable. Beosound 9000 though, being crafted from tinted glass and large machined metal pieces seemed to reverse this trend. Text copyright © Beocentral. Unauthorised reproduction prohibited. Beosound 9000 comprised an AM/FM radio and a CD player which could be loaded with 6 CDs. “CD changers”, as multiple CD players are often called, tended up until this point to be confined to car-audio and the more vulgar end of consumer Hi-Fi, so it was clear that if B&O were to offer such a machine, not only must the quality be at least equal to what could be expected from a decent “single” CD player, the styling must separate the new model from all others, so that the difference would be clear. A CD changer was in fact an obvious product for B&O to offer, the “link” system made far more sense if more than one disc could be selected without having to go to the player. A rather inferior attempt had been made at this already for the American market using a machine intended for car use connected to a Beomaster 7000, though clearly such a crude arrangement would have little appeal in Europe. Text copyright © Beocentral. Unauthorised reproduction prohibited. 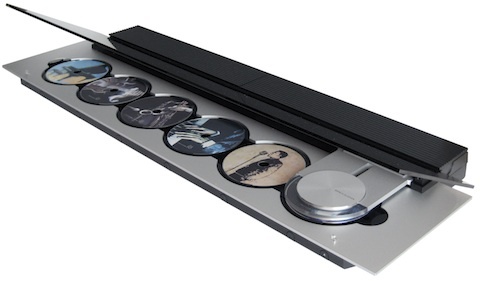 As can clearly be seen, the Beosound 9000 places 6 CDs in a row along the length of the machine. A device called the clamper (in fact a bit of an understatement as it contained the whole CD player including the decoder and servos) travelled along and played any disc in the position in which it was placed. This arrangement meant that the whole assembly could be kept reasonably compact. The clamper was driven at high speed by a powerful motor, so protective devices based on light beams were installed to prevent either damage to the machinery or injury to the user. If fingers or other foreign objects were detected, movement would stop until the obstruction was cleared. In addition, when the glass lid was opened the clamper would move far more slowly. The lid itself was power operated and was opened by pressing a button on the front edge of the machine. Similar buttons next to each disc position allowed direct access to each CD. With the lid closed, if a position was called up that contained no disc, that position became “blocked” until the lid was opened again. Red LED indicators next to each showed that this had occurred. Should the power fail, the lid could be opened by force, though the rather flimsy nature of the mechanism meant that this could not be done too many times. Text copyright © Beocentral. Unauthorised reproduction prohibited. As would be expected from a CD changer, programming options were available to make the best use of having such a large number of titles available at any one time. Track and disc sequences could be programmed, or a random sequence could be started that could select any track from any disc. Discs could also be “named”, so that the title or artist was shown in the display (mounted on the clamper and visible through a red tinted section of the lid) and “edited”, so that particular tracks would be missed out whenever the disc was played. As the discs were always visible, a rotation sensor was added to the spindle motor to that they were returned after play to be at the same angle at which they had been positioned by the user. Text copyright © Beocentral. Unauthorised reproduction prohibited. The radio section was in all ways conventional. Stations could be stored in the memory and named, though this had to be done manually as an RDS decoder was not fitted. Text copyright © Beocentral. Unauthorised reproduction prohibited. Connection to the loudspeakers was by Power link, with the Beolab 8000 as an obvious choice. Master Link was also available for more complex set-ups. A 7-pin socket was fitted to connect external equipment (selected as “A-AUX”), or for connection as a CD player only to an existing Hi-Fi system. If this was the only means of connection, the radio section was disabled. Remote control was possible using a Beo 4, which had to be bought separately. Text copyright © Beocentral. Unauthorised reproduction prohibited. Various stands and brackets were available for shelf, floor or wall mounting. The keypad (under a hinged lid at the rear) could be removed and turned around so that the keys were the right way up, and when this was done the text in the display was changed automatically to suit. Text copyright © Beocentral. Unauthorised reproduction prohibited. Despite the expensive materials used and the apparent quality of finish, the Beosound 9000 proved problematic in service. In particular the CD laser pickup was not very durable (despite a number of different types being tried), and early versions of the control software would occasionally lock up and stop the unit functioning. The glue that held the glass door to its hinges was also not strong enough in some of the first sets produced, a problem that the factory considered serious enough to warrant a recall programme to correct. Later models (recognisable by the absence of a red mains switch at the rear and different menus (e.g. “Net Music” instead of “A.Tape”) were a little better in some respects. Text copyright © Beocentral. Unauthorised reproduction prohibited.